An initiative by The American Heart Association is raising awareness and encouraging people, of all ages, to make even small differences to their lifestyle to improve the health of their heart. With one in four deaths in the US caused by heart disease and over seven million people worldwide suffering a heart attack each year, why does it appear that medical advancements regarding the heart are trailing behind those relating to other human organs? No cell is an island – this especially goes for heart cells. The heart is a collection of individual cells and the way in which they interact is the very source of their ability to pump blood around the body. Heart cells, cardiomyocytes, begin life beating independently and at different speeds. After two or three days the cells join together and pores open between adjacent touching cells. This gap makes the heart cells work in unison and failure for heart cells to beat together in rhythm means a patient is likely to need a pacemaker device to help regulate heartbeats. Once damaged the human heart can never fully heal. For quite a number of years scientists believed that the adult heart was unable to generate new cells, unlike for example, skin and blood cells that continually renew and repair themselves. The ability for a cell to regenerate offers potential to treat disease by accelerating cell growth either in the body or in a laboratory. Since applying carbon-testing techniques to living human hearts, there is evidence that the heart can in fact generate new cells, however it’s at a particularly low rate and only under very specific conditions. Tests show that, on average, heart cells are six years younger than the heart in question, representing a regeneration of between 1% and 2% a year, the rate declining with age. Typically, children and young adults will see new cell growth of 2% per year compared to those over 70 who benefit from just a fraction of 1%. Cell Based Therapies – Could They Be The Answer? Heart failure occurs when the heart becomes too weak to pump blood efficiently. Despite a greater in depth understanding of human heart cell generation and the complexity of their structure, there is still no alternative to a heart transplant. Stem cell research is proving a slow process. Whilst cardiomyoctes can now be made quite easily in a lab, they are made from stem cells not found in the heart and challenges remain before they can be used on patients. A unique trial has recently commenced into gene therapy as a means to treat heart failure. The British Heart Foundation Centre of Regenerative Medicine heads the study at Imperial College London. “The therapy isn’t correcting a gene defect”, says Professor Sian Harding. The scientists are working on using gene therapy for treatment of heart failure even if it was a consequence of lifestyle, environment, genes or a combination." Which health initiatives do you think are making the biggest impact & creating positive public awareness? Creating healthy habits is easier when there are plenty of healthy role models but, as Educators, are we setting the best example? Encouraging your students to lead healthy lives and look after their hearts can be difficult. 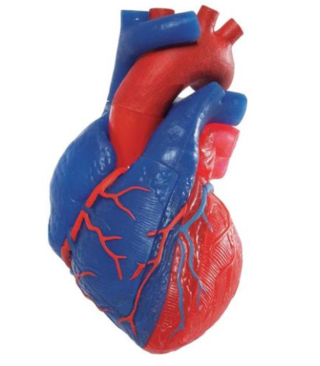 However, 3B Scientific is committed to providing high quality medical and health related teaching supplies, simulators and anatomical models to help you communicate clearly to your class. Download our Free catalogs today!